If you've been keeping an eye on the Tallahassee real estate market, then you probably know that we have been bouncing around the bottom here for a few years. In fact, we have begun our fourth year at roughly the same level of home sales in the Tallahassee MLS, a level that reflects about 50% of the normal amount of home sales for our area. Home sales in the Tallahassee real estate market began to dive in 2006 and did not stop until a bottom was found in August 2009. The real estate graph below shows the one year average of daily closed home sales in the Tallahassee real estate market. With the exception of the Homebuyer Tax Credit which pushed sales up for the summer of 2010, we have seen home sales in the Tallahassee real estate market stay fairly steady at roughly 6 closed per day. 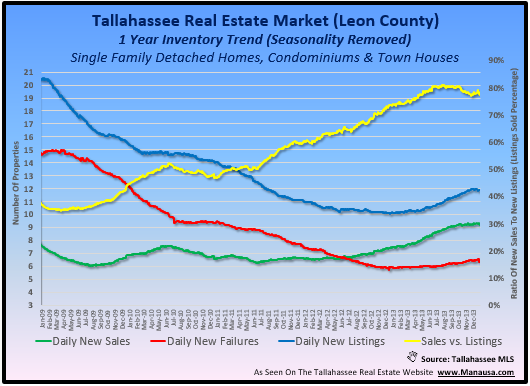 Despite the best efforts of the National Association of Realtors to puff NAR real estate reports, the graph above shows the reality that we face in Tallahassee. Home sellers should study the market and try to understand the depth of their competition. The average relative supply of homes stands above 11 months of supply, and some of the higher price points are measured in years. This means that competition is tougher today than it was just three months ago. More people in Tallahassee want to sell a home than buy a home, so you have to position your home wisely. And if you absolutely need to sell a home in Tallahassee, it is not too late. You need to use the top progressive home selling plan, and you need to work with a real estate company that can aggressively market your home for sale every single day. Join the thousands of happy home sellers who got rid of their homes, despite poor housing market conditions. Don't make the mistake of "testing" the market, rather attack the Tallahassee real estate market with the best strategy available in real estate today.